GE Healthcare is recalling a host of infant resuscitators from the past five years over a serious error during the assembly process. The FDA announced Feb. 28 that it has designated the recall as Class I. FDA officials think the resuscitators could potentially seriously injure or kill infants because oxygen and air wall inlet fittings on their back panels were reversed during assembly. The FDA says: "These recalled products may interfere with oxygen delivery resulting in inaccurate oxygen regulation in newborns (neonates) and may lead to low blood oxygen (hypoxia) or high blood oxygen (hyperoxia). This may cause death in neonates, particularly those who are critically ill. Preterm and low-birth weight babies are also at increased risk in terms of morbidity and mortality." 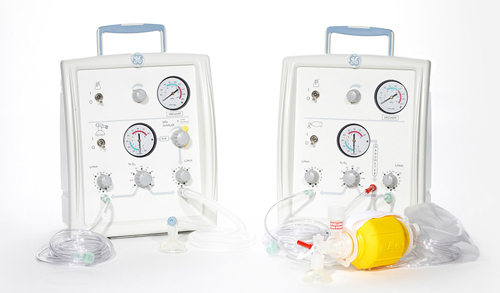 The Giraffe Stand-alone Infant Resuscitation System, as shown on GE Healthcare's website. The recall involves a wide swath of GE infant resuscitators manufactured between April 2007 and October 2013, including the Giraffe Warmer with Resuscitation System, Panda Warmer with Resuscitation System, Giraffe Stand-Alone Infant Resuscitation System, Resuscitation System Upgrade Kits, and the Panda Freestanding with Resuscitation System. The FDA announcement includes links to the affected lot numbers. GE Healthcare sent an Urgent Medical Device Correction letter, with a return receipt, to all affected customers on November18, 2013. The recall comes less than a year after GE Healthcare issued a warning for its Giraffe OmniBed and Giraffe Incubator. Impacted units, made from August 1 to December 20, 2012, had an issue in which manual settings for the radiant heater and oxygen delivery system could be overwritten when the device was powered on. Setting could also be overwritten when a power interruption caused the unit to restart. Find out more about the medical device industry--including its technology, supplier networks, and much more--at BIOMEDevice, March 26-27, 2014 in Boston.